Peter Ince slipped his moorings in 1998. 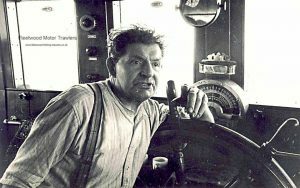 He had been a fisherman for most of his life, sailing for the Boston Deep Sea Fisheries Co.Ltd. The decline of the fishing industry and a knee injury sustained off Iceland put an end to his trawling career. He was Bosun for as long as I can remember, colour blindness prevented him from rising any further. Some of the trawlers that he sailed on were “Braconbank,” “Bulby,” “Boston Canberra,” “Boston Seafire, Boston Firefly,” “Princess Anne,” “Boston Phantom” and “Prince Phillip”.